Traditionally, Indian wedding extends to be a week long affair and speaks of the tradition, culture and heritage of the country. In Indian wedding, there is an event for almost everything. Generally, the wedding is divided into three parts - pre wedding, wedding and post wedding. Rituals like 'Haldi', 'Mehandi' 'Sangeet' and 'Tilak' are pre wedding rituals. Before the wedding, the to-be bride and the groom's families visit each other and exchange costly gifts to each other along with sweets, fruits and dry fruits. India, an amalgamation of different ethnic groups, varied cultures and different languages offers a lot of vivid colors in its wedding ceremonies. Be it a Hindu marriage, Christian wedding, Punjabi shaadi or a Muslim marriage, India gives you sneak peek into all. Traditional Indian wedding is a rainbow of colors. People of every religion and region celebrate this auspicious ceremony in their own special style. If in northern India you can be a part of Sikh weddings, Buddhist weddings, Arya Samaj weddings, in southern India Marathi marriage, Gujarati wedding, Telugu wedding and Christian wedding ceremonies will win your heart over. In eastern part of India you will come across Bengali wedding ceremonies. Wedding customs in India vary according to ethnic groups and castes. 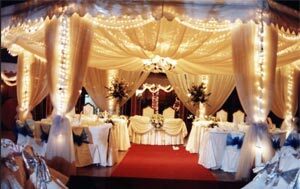 Especially country like India, have different kinds of wedding ceremonies because we have varieties of cast and creeds. Weddings in the metropolitans have parades or car for the wedding processions; full fledged band instruments such as trumpets and trombones, ferry lights all over the house which is naturally more expenses. These weddings are completely different from the traditional remote village weddings. They are very simple for very rich in culture. Wedding in India is a multi day event, which may engross an entire village. In its essence, it reveals the very strong social and communal values of the Indian people. Few things in India culture take precedence over a wedding and most people treat the time as the opportunity of a lifetime and a time to hold back and celebrate with varieties of foods, fun and dancing. Weddings generally take place in tender age in India. It is normal for boys and girls to be married during their teens but in few cases in very young ages. The wedding procedure usually begins with an arrangement of a boy and a girl with comparable backgrounds; often with the help of a priest who are well know as matchmaker. The meeting takes place between the parents of the two families. In an arranged marriage, it is the parents who choose their children's partners. Making your special moment an unforgettable celebration, we provide personalized and innovative wedding services. Dreaming of a traditional wedding or cruise wedding, we help you to turn your dream wedding into a reality. Embark on a new journey together in style and leave all your worries behind. India Wedding Planner services include your wedding tour booking, hotel booking, flight booking, car rentals, wedding preparation, honeymoon arrangement and many more. As we have seen the different way of wedding such as wedding in the air during sky diving, under water wedding in ocean during scuba diving, wedding in the highest peak of the world, Mt. Everest during expedition any many more unique ways to cherish the moment for lifetime. The traditional Indian wedding is one of those experiences to gather. As mentioned earlier, wedding customs in India vary according to ethnic groups and castes we have tried to cover all most all different tradition as your require.